In the month of April, I’ve posted a review on the newly open Segafredo Zanetti Espresso in Pavilion Kuala Lumpur. Ever since then, I fell in love with this coffee joint and I’m proud to say that it’s still my frequently visited place when it comes to having a good cup of coffee with peace. Now why do I say that? It’s because this place is not located on the main aisle of Pavilion Kuala Lumpur where you’ll see dining places like La Bodega, Michelangelo’s and even Starbucks. 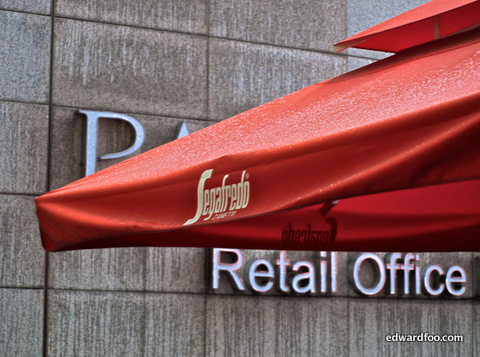 Segafredo Zanetti Espresso is located on the opposite side of the aisle, a corner next to Bentley and EON Bank. Due to its location, it’s generally quiet with few passerby. Therefore, it’s an ideal place to sip a cup of coffee if you would like to be in the big city minus the crowd and intense noise pollution. Visited the place on a sunny weekend. Started to rain with the current unpredictable weather and I moved to the bar instead. It makes one wonder why is there a revisit review on Segafredo Zanetti Espresso. Simply because they have new menu on both food and beverage. To name some, you can now find pizza and german potato salad to fill that hunger of yours. And if coffee isn’t your kind of beverage, why not quench your thirst with a bottle of Hoegaarden? However, do take note that Segafredo Zanetti Espresso now charges 5% on the total bill for Government Tax. But what’s the big deal if you enjoy the atmosphere and coffee there? I wouldn’t mind so long as I get a peace of mind with my coffee. Full set of Segafredo Zanetti Espresso HDR images is found at my flickr page. that’s because im skivin, now am back to work yeah but at least got 2 different shot of the weather.